Secure Base Leaders engage in a high level of caring and also encourage a high level of daring. In this way, both the leader and their followers can reach the highest levels of performance and have the most positive impact on others. We call that place the “sweet spot” of leadership. This sweet spot is of particular relevance to organizations focused on learning, innovation and change. Unfortunately, we can’t give you a precise recipe for the sweet spot. Secure Base Leaders mix together nine (9) characteristics in just the right way, at just the right time, to provide just the right amount of safety and encourage just the right amount of risk. A Secure Base Leader remains composed and dependable, especially when under pressure — times at which other leaders may respond impulsively an unreasonably. In fact, this characteristic is so fundamental that a leader needs to master it before he is able to portray other characteristics. Our research shows that a key component of being a Secure Base Leader is an acceptance and acknowledgment of the basic worth of others as a human beings — beyond being employees or manifestations of job descriptions. Secure Base Leaders show caring for the human being before focusing on an issue or problem. They separate the person from the problem. As far as possible, they avoid judging and criticizing people. This approach makes other people feel legitimized and affirmed. This characteristic goes beyond acceptance of the person’s inherent value and possibly even goes beyond what the person expects from himself. Importantly, this characteristic is not about short – term potential. Instead, it is about a deeper vision or even a dream for the person’s deepest potential — not in one year, but in 10 or 20 years. Secure Base Leaders listen and inquire rather than “telling” and advocacy. Secure Base Leaders do not follow the all too common pattern of launching into monologues to convince others of their point of view. Instead, they master the arts of asking open-ended questions and engaging in a dialogue to seek a greater truth. Listening and inquiry open up the possibility for bonding, help a leader encourage appropriate risk taking, and are critical components of giving and receiving effective feedback. Secure Base Leaders have the ability to impact people deeply with single sentences or gestures that carry tremendous power and are often remembered for many years. Memorable, powerful messages shine like a beacon in the fog of change. Short, inspirational messages give people direction at times when fear, uncertainty and doubt permeate the environment. Secure Base Leaders are good at directing the mind’s eye of other people to focus on the positive rather than the negative. They focus on benefits, create images of hope and possibility, and help people visualize the attainment of a goal. They set positive expectations that contribute to improved follower performance. In so doing, they help others to see their potential and inspire learning, even in a crisis or time of difficulty. Note that you can be tough and give critical feedback while retaining a positive perspective. In very concrete ways, Secure Base Leaders give their people opportunities to reach their potential, many times with some personal risk attached. This characteristic goes beyond acceptance and beyond seeing the potential: it takes those concepts into direct action. Secure Base Leaders actively dare people to unleash their potential by providing tangible opportunities for risk taking. They support the autonomy of their followers, and their followers do not feel over-controlled. Secure Base Leaders understand the importance of “intrinsic motivation” to get the best out of people rather than relying on extrinsic motivation. Intrinsic motivation refers to doing something because it is inherently interesting, enjoyable or fulfilling. Compare that to extrinsic motivation in which a person does something because it leads to an outcome that is separable from the pure task. Common extrinsic rewards in business are bonuses and promotions. When intrinsically motivated, a person is moved to act for the learning, enjoyment or challenge involved rather than because of external pressures or rewards. Don’t panic that you are about to lose your weekends and evenings to your colleagues! It turns out that physical proximity and frequency of interaction are less important than conveying the spirit and intention that you are available. In fact, many Secure Base Leaders are neither in regular contact nor physically present to the people they influence. Many of the most powerful conversations Secure Base Leaders have, in fact, are very brief and direct. One could almost think of this characteristic as the psychological presence of a secure base who plays a role even when not physically there. You do not need to master each and every one of these characteristics to provide the right balance of caring and daring. Instead, pick one or two to focus on at a time. You – and the people who work for you – will be grateful you did. 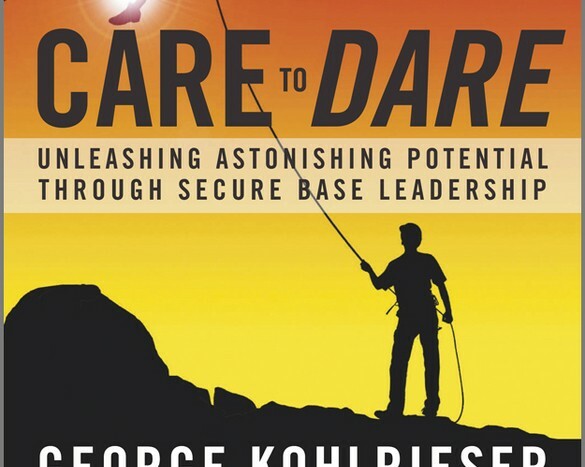 Excerpted with permission of the publisher John Wiley & Sons, Inc. from Care to Dare: Unleashing Astonishing Potential Through Secure Base Leadership, by George Kohlrieser, Susan Goldsworthy, and Duncan Coombe. Copyright (c) 2012. George Kohlrieser is an organizational and clinical psychologist, a professor of Leadership and Organizational Behavior, and, creator and director of the flagship High Performance Leadership Program at one of the world’s leading business schools, IMD (International Institute for Management Development), located in Switzerland. Contact him at george.kohlrieser@imd.ch. Susan Goldsworthy is founder and CEO of Goldswolf & Associates, a company specializing in leadership development, and is also on the faculty at Webster University in Geneva. Contact her at goldswolf@mac.com . Duncan Coombe is a teacher, researcher, and advisor. He is on the faculty of Ashridge Business School and is a consultant to the Fowler Center for Sustainable Value. Contact him at duncan@duncancoombe.com.